You Saw This Coming - Oh No They Didn't! 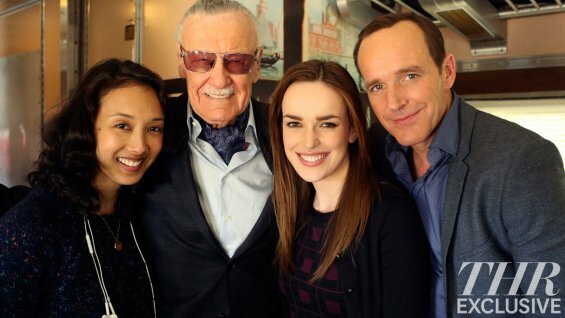 Stan Lee to Appear on Agents of S.H.I.E.L.D.! The king of cameos is at it again! The Hollywood Reporter has learned that Stan Lee will make an appearance on Marvel Entertainment's live action TV series "Marvel's Agents of S.H.I.E.L.D." in an episode that will air February 4th. Though Stan wouldn't reveal what role he's playing in the episode, he did describe it as a "big one." You can see the first image of Lee on the set with the show's executive producer Maurissa Tancharoen and stars Elizabeth Henstridge and Clark Gregg below! What role do you want to see Stan Lee play in the series? "Marvel's Agents of S.H.I.E.L.D." airs Tuesdays at 8 P.M. on ABC. Join us in the livewatch chat! I like FitzSimmons, and sometimes May. That's pretty much it. I like the original Coulson, but I am nhf the Coulson in this series.